A Beginning Point: These suggestions are meant to share with you “a” way to deal with “boat juice,” that is, electricity on your boat. They are not meant to express “the” way. You are intelligent and capable of taking these suggestions and modifying them to suit your boat and situation, or to reject them entirely. Why Boat Juice: Lights, among other things. Not every boat needs lights. If you sail a small dingy and have no outboard, you can be “legal” by simply turning on a flashlight when approached by another boat. But, being “legal” is not the only reason to have lights. We have all seen motorboats travel across the Lake at very high rates of speed. You should give them all the help you can to see you in plenty of time to avoid running over you. You don’t want to be legal and dead. If you want regular red and green bow lights and a white stern light, you don’t have to install a battery and wiring. All of the marine supply houses sell lights that can be temporarily attached to your boat. They are flashlights with a red/green lens and a white all-around lens. They may attach by a suction cup or a clamp. They use D-cell batteries. They cost less than $15 per light. The Next Step Up: If your boat can handle a larger battery or you want more than just lights, let’s begin by discussing the battery. When I first started sailing Orion thirty-seven years ago (time flys when you’re having fun), I purchased a heavy 105 amp-hour deep-cycle battery. I wanted to be sure that I could operate the running lights and the interior lights for days on end and also start my 9.9 hp outboard. While the outboard also generated boat juice, I rarely ran it enough to adequately recharge the battery. This was before the advent of solar panels, so my only choice was to pull the “beast” out and take it home to recharge it. And at 105 amp-hours, it took forever to get a full charge. Lugging the huge battery around not only made me stronger, it made me smarter. I traded it in for a 34 amp-hour battery which I could carry with one hand. I could also charge it much quicker. With the 34, I never ran out of juice, so I had been lugging the beast for no good reason. Later, solar panels became available and I installed one. Then I didn’t even have to take out the 34. For reasons I cannot recall, I switched back to a larger deep-cycle battery since the solar panel made it more practical. For you, technology has made boat juice even easier. Up to this point the batteries I have had have been “lead-acid” batteries. They have thick lead plates that are surrounded by liquid sulfuric acid. They still have the advantage of being the cheapest type you can buy. But they have a few disadvantages. If turned on their sides, the acid can leak out and cause a lot of damage. Periodically you need to add water to the batteries because the water evaporates some when the batteries are being charged. If you don’t add water, the battery can be destroyed. And, finally, they lose some of their charge just sitting around. Your benefit from technology has been the invention of AGM batteries. Instead of surrounding the lead with liquid acid, the plates are infused with and surrounded by a gel. You can turn them on their sides and even upside down without anything running out. They do not lose any charge just sitting around. And they take a charge faster. But, as you might expect, they are more expensive. But you are in luck. Batteries & Bulbs, Plus on the By-Pass in Bowling Green will sell you AGM batteries in every size imaginable. And, they have a selection of “seconds” that they will sell you for half of what AGMs would normally cost. Their “seconds” are not damaged or used batteries. They just have some “blemish” which usually amounts to a missing label. I have purchased a 15 amp-hour AGM for $55 that I am going to try out on Orion for racing. It is only 5” by 3½” by 6½” tall and only weighs 11.8 pounds (compared to 55 pounds for my big lead-acid battery). This same battery or even one smaller would be perfect for most boats in the Club. Wiring: Now that you have your battery installed securely, you will need to connect it to the light, bilge pump, or other device. If you are only going to connect to a very limited number of things, you can almost run your wires right back to the battery. Since we use direct current (DC), we have to run a wire from the positive (+) terminal on the battery to the positive side of the device and then from the negative (-) terminal on the battery to the negative side of the device. You will need some way to turn the device on and off. Sometimes that is on the device, itself, and sometimes you have to put a switch in the positive line. One other thing you should install is a fuse or circuit breaker in the positive line, as close as possible to the battery. On Orion I use circuit breakers for both the overload protection and as the switch. You can use circuit breakers made for alternating current (AC) in your DC system. You can get breakers from the marine supply houses, but you can probably get them cheaper from Lowe’s or Wal-Mart. Get the lowest amp breakers you can get and still let enough juice through to operate the device. If you want to use fuses, you can get fuse holders and fuses from any auto parts store. You can also get switches there too. The purpose of the fuse or circuit breaker is to shut off the juice if there is a short in the positive wire. Without a fuse or breaker, the short can cause your boat to catch on fire. Get extra fuses so that you are not out of business if one of them blows. Wire Sizes and Types: Wires offer some resistance to the electrons as they pass through. You might think of it as pipes. The greater volume of fluid that tries to pass through a pipe, the more difficult it is for it to get through. The larger the pipe in relation to the volume of fluid, the easier it is for it to get through. Switching back to wires and electrons, if you try to push too many electrons through a thin wire, it will tend to block the electrons and will make the wire hot. So why should you care? Don’t try to run thin (as in 14 or 16 gage) wire for something critical like running lights. That good juice in your new battery will not get to the lights and they will be noticeably dimmer. By the way, the size of the wire increases as the gage number decreases. 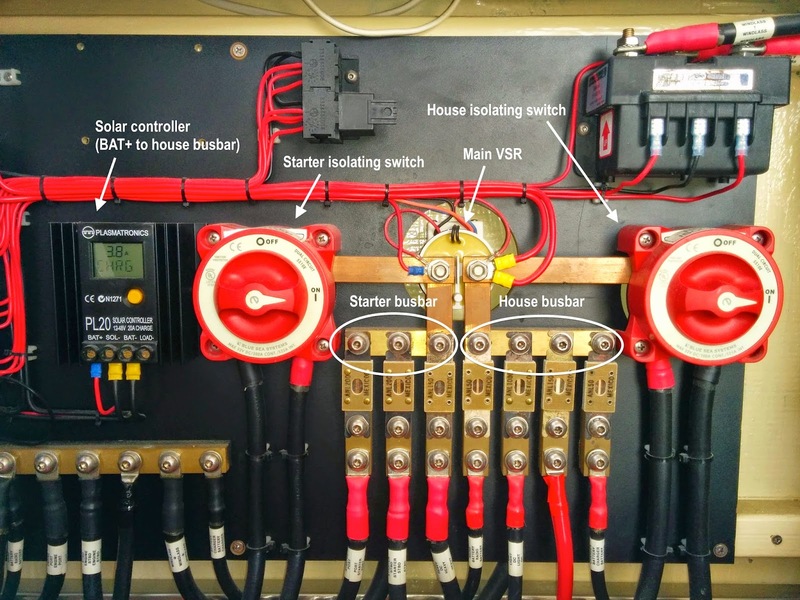 For Orion, all of my wiring is 10 gage (except for the wire from the battery terminals to the buss bars –more on this below). The greater the current, the lower the gage (and thicker the wire) needs to be. Also, the longer the total distance to and from the device, the lower the gage (and thicker the wire) needs to be. Now for a “do what I suggest and not what I have done.” All of the books on marine wiring are adamant, “Do not use solid wire; use stranded wire.” The reason is that solid wire can work-harden with the vibration of a boat and become brittle. Well, I learned that little tidbit after I had wired Orion. Solid wire was just what I had. It has lasted for 37 years, but who knows; it could break any day now. Seriously, on Truelove which is intended to sail in the ocean, I would always use stranded wire. Buss Bars: If you are going to connect more than a very few devices to your battery, you probably should use buss bars. A buss bar is a flat piece of copper about one inch wide and six inches long with holes drilled in it and usually number 10 copper screws put in those holes. There is a larger screw at one end. A relatively heavy cable is run from the positive terminal of the battery to the larger screw of one of the bars, and a relatively heavy cable is run from the negative terminal to the larger screw of the other bar. Then, rather than attaching the wires going to the devices directly to the battery terminals, those wires are attached to the appropriate buss bar. This keeps wires from getting tangled up and coming loose from the terminals. It also makes it much easier if you want to take the battery out of the boat; you only have to take two wires loose. Splices and Rings: You can splice pieces of wire together to make longer wires. You can also attach a ring or other fixture to the end of a wire to make it easier and more secure to connect it to a device or buss bar. One major rule that even I don’t dare violate is: “Never use wire nuts (where you twist the wires together up in a plastic thimble) to join two wires or to connect a wire to a devise.” They may be acceptable on land, but they are forbidden on board boats for numerous very good reasons. Splicing wires and attaching a ring use the same technique and supplies. For a splice, you get a small metal tube just barely large enough for the bare wire to go into. The tube is covered by plastic or some other material. There are generally three sizes for the gages we normally use. For thin wire the cover is red or pink. For the middle size the cover is blue. And for 10 and 12 gage, the cover is yellow. You start by cutting off the enough wire to expose good wire. You then trim the insulation of the wire back only about 1/8” or 3/16” and insert the bare wire into one end of the tube. It should stop half way through the tube with the insulated portion of the wire barely in the covering of the tube. You then use a crimping tool to crimp the half of the tube with the new wire in it. After that you do the same thing for the other wire on the other end. If you are attaching a ring, you will be putting wire into only one end and crimping it. I recommend that for boats you purchase heat shrink splices and rings. Surprisingly, you can find them at some auto supply places as well as the marine supply houses. They are usually the same color as the others, but sometimes they are more translucent. Once you have both sides of a splice in and crimped, you heat the splice with a heat gun, or a lighter if you don’t have a heat gun. The coating on the splice will shrink tightly around the tube and wire giving the splice more strength and keeping water out. When I am working on Truelove, I even get heat shrink tubing slightly larger than the splice. I put a piece of the tubing on the wire and move it out of the way. After I have completed the splice, I slide the piece of tubing back down to cover the splice. I then apply heat and shrink the tubing around the splice. Just double protection. Often people ask about using solder to join wires. The strong consensus is to use crimping instead. Like solid wire, the solder can get brittle and break. Also, if the wire gets hot, the solder can melt and let the connection go. Besides, crimping is easier to do correctly and, with heat shrink, produces a strong, weather-tight bond. This entry was posted in Lore of the Sea, Maintenance, Repairs by Port Oliver Yacht Club. Bookmark the permalink.